The senior center was buzzing with activity when the Happy Helpers arrived. The Easter luncheon was one of the big events held at the senior center every year. Mrs. Snow was there, directing the volunteers. When she spotted the girls, she waved them over to where she was. “We have to get these favors on the tables at each place.” She handed a boxful to each girl. They were tiny straw hats decorated with flowers and birds attached to tiny hat racks with even more flowers and birds. Amber noticed some of the ladies from the Community Church arranging larger hat decorations in the center of each table. Some other ladies were setting up the buffet tables and placing hat decorations there as well. The Happy Helpers took their boxes of favors and started putting them out at each place. When they were finished, Mrs. Snow gave them boxes of silverware wrapped in pastel-colored napkins, each tied with a pink, green, or yellow ribbon. Plates had been placed at the beginning of the buffet line, and the glasses were on the beverage table. “Is there anything else we can do?” Laura asked. “Would you like to be greeters at the door?” Mrs. Snow suggested. “That sounds like fun,” Melissa said with enthusiasm. Mrs. Snow positioned the girls at the front door and handed them some programs to give out to each guest. The first couple through the door was Hank and Clarisse Anderson. 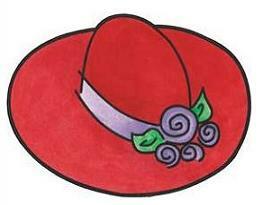 Clarisse was wearing a fancy red hat with tiny roses and feathers around the brim. When Melissa told her how beautiful it was, Clarisse said that it was called the Titanic. “It cost about as much as the Titanic,” Hank added. Clarisse shot him a dirty look. “I want to catch everyone when they arrive in their hats,” Hank said. “You have a nice hat,” Laura commented. “It looks like something from the Titanic movie too.” Hank wore a brown felt hat with creases in the front. “It’s a fedora,” Hank said proudly. Gus was the next to arrive. The girls tried not to chuckle when they saw his hat. It was a black visor with black and gray hair sticking out of the top. This was especially funny since the girls knew that Gus had no hair at all underneath the hat. “Like my hat?” Gus asked. “It’s really you!” Melissa giggled. “Maybe the goofiest,” Melissa whispered to Amber. Doris Duncan came in using a walker. Her hat was made of straw and was decorated with beautiful fresh flowers. Betty Jenkins wore a gray cowboy hat with a decorative band and black feather.